Founders of Algoworks have been awarded the Stars of the Industry Awards 2018 (for the excellence in Digital Marketing) by ET Now, in the category 'Best Mobile App Development Agency'. 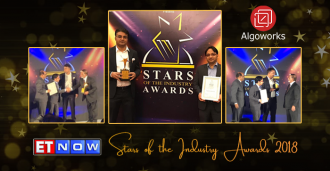 SUNNYVALE, Calif. - Dec. 22, 2018 - PRLog -- Ajeet Singh and Rachit Agarwal, the Founders of Algoworks, have been honored with the "2018 Stars of the Industry Awards" for excellence in Digital Marketing in the "Best Mobile App Development" category, in an award function organized by ET Now. Labeled as "Oscars of India" (https://economictimes.indiatimes.com/news/company/corporate-trends/glitz-and-glam-of-economic-times-awards-for-corporate-excellence-2018/many-stars-under-one-roof/slideshow/66676445.cms) by the media, this was the annual award function of the ET Now group. The Stars of the Industry Award proved to be early Christmas gift for the Founders of Algoworks. It was a thrilling moment to be awarded by a top-notch media house of the country- ET Now. The marvelous trophy brought loads of honor and pride to the Algoworks family. Mr. Rachit Agarwal was quoted as saying-"Every award marks a new milestone we have achieved in this victorious journey. We have worked so hard to earn these acknowledgments and these trophies inspire us to keep going." Both of them were overjoyed when they brought the sparkling trophy and award to the Algoworks office. Celebration vibes increased multiple times for Algoworks by this great achievement just before Christmas. Stars of the industry group is an independent and non-profit council, their sole purpose is to make "work and working lives better". This year's Stars of the Industry Awards was another successful episode in the series of Annual award function of ET Now group. ET Now is a top business and finance news channel based in India, owned and operated by Bennett Coleman & Company Limited, They also encompass the domains of Environment, Technology, Governance, and Politics under their areas of coverage.